A distinctive discussion of the nonlinear dynamical phenomena of semiconductor lasers. 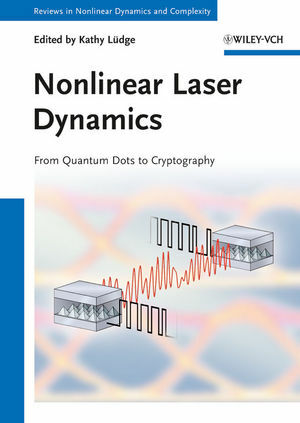 The book combines recent results of quantum dot laser modeling with mathematical details and an analytic understanding of nonlinear phenomena in semiconductor lasers and points out possible applications of lasers in cryptography and chaos control. This interdisciplinary approach makes it a unique and powerful source of knowledge for anyone intending to contribute to this field of research. By presenting both experimental and theoretical results, the distinguished authors consider solitary lasers with nano-structured material, as well as integrated devices with complex feedback sections. In so doing, they address such topics as the bifurcation theory of systems with time delay, analysis of chaotic dynamics, and the modeling of quantum transport. They also address chaos-based cryptography as an example of the technical application of highly nonlinear laser systems. Kathy Luedge holds a position as senior scientist at the Institute of Theoretical Physics at the Technical University, Berlin. Her research interests are modeling of semiconductor quantum dot lasers, nonlinear laser dynamics, and control with optical feedback. For many years, she has been collaborating with both experimental and theoretical scientists from renowned international institutes.